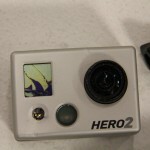 GoPro HD Camera Vs. Fire Truck! 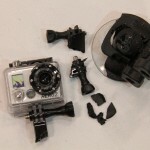 Who says that GoPro camera’s are indestructable? We have proof that they aren’t. Especially when being run over by a really really big Fire Truck. Our task – show the underneath side of a vehicle (specifically a fire truck along with a couple of other vehicles), using a product that a local company makes. 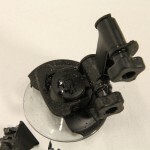 This product, is a device that when activated flips down to the wheels, and spins in conjunction with the wheels, and spins around chains that fly under the vehicles wheels giving it traction in the snow and ice. Pretty cool huh? Well, the hurdle was how do we film under the vehicle and see the product working. Kirk didn’t really want to be strapped under a fire truck driving through snow, so we had to get a camera under the truck. 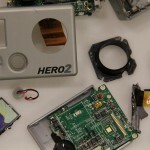 Enter a GoPro HD camera. Perfect! It’s little, easy to position and shoots in HD. not good enough. On one of the trips out, down went the GoPro and since it was basically right in front of the wheels, it got run over, and batted around by the chains. As it would happen, we still needed the card out of the camera, and it looked like the card may have survived. 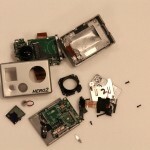 So we had to tear apart the camera. It was trashed anyway. 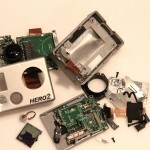 So, now you can see what the inside of a GoPro looks like. As it turned out, the SD card did not make. DOA. We tried several times to revive it, but alas, it was not meant to be. As a follow-up. Kirk did get a second GoPro HD camera rigged underneath the truck, and we got some great footage! Pretty cool what it looks like under a fire truck.